Whether it is activating water systems at a touch or reminding the kids that you are closed on Mondays, a quality park controller is a must have for any Spray Park. 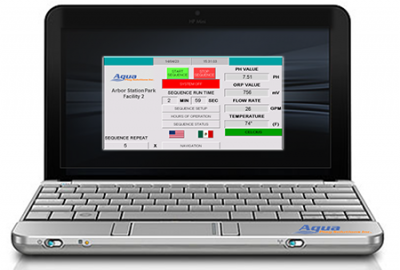 that’s why Aqua Play Systems spent years designing and refining the most comprehensive line-up of of PLC spray park automation systems in the industry. 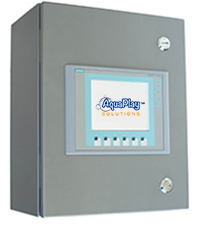 We offer super value touch screen controllers costing thousands less than the next closest competitor and everything in between, including super-smart systems that will let you monitor and control your park and water chemistry no matter where in the world you happen to be. Affordable and compact, the Value Series line offers all of the features of most other brand controllers at a fraction of the price. Starting around $2000.00, these are perfect for projects with budgetary constraints but without sacrificing function. Despite the low price tag, all come packed with convenient features and include many of the user-friendly operating proceedures as their big brothers. Quick firing valve operation and virtually unlimited sequencing patterns to create awesome choreagraphed spray effects. 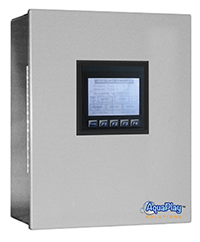 Full calender and time park operating parameters plus auxiliary I/O connections for activator and water supply valve or activator and feature pump. On screen “Help” menu all but alleviates the need for an Operating Manual. All Value Series Controllers arrive power ready with a standard 120VAC outlet plug. A NEMA4X enclosure seals this package of professional grade components and build quality. Our most popular controller. The Premium Series line offers high quality throughout with “bullet proof” internal componentry and HMI by Siemens®. Each is professionaly assembled into an attractive NEMA4 enclosure and U.L. rated. Sequencing is virtually unlimited with touch-and-toggle patterning and quick firing capability for popping water effects if desired. Owners can easily save sequencing patterns to use later or for low flow operations during water restrictions due to dry climate. Setting days and hours of operation is super easy as is manual valve operation for adjusting spray features. We have replaced commonly used fuses with less tedious circuit breakers for simpler trouble shooting. Operating a Premium Series is a breeze. With an ultra user-friendly design and large full color touch screen, these are incredibly easy to setup and adjust. Straight forward on-screen prompts make the need for an Owners Operating Manual virtually unnecessary. Our Master Controllers will not only handle you park operating parameters and spray features, they will keep your water clean and your park safe and secure. All without ever leaving your desk. Like all of our controllers, we have replaced technical confusion with clear simplicity. All screen functions are straight forward and include full color touch (or mouse and click) HMI programming. Even our chemical functions are understandable and self-correcting if errors are made.PH, ORP, test cell flow and water temperature can be viewed in real-time as well as other optional indicators. With our quick-download software, park observation and adjustments can be accessed in seconds from any location…no matter where in the world that happens to be. Add live security video feed, lightning alert system and local park weather radar for an even greater level of safety and convenience. Not able to access your PC to check on your park? Don’t worry, it will give you a call or text you if something is amiss that it cannot correct. A fail-safe system will stop everything if you are unable to respond. Have questions about our Park Automation Controllers?